FLEXIM system significantly reduces heating costs in centrally heated buildings, while allowing thermal comfort to be set individually in individual rooms/zones throughout the year (during the heating season or even outside the heating season). 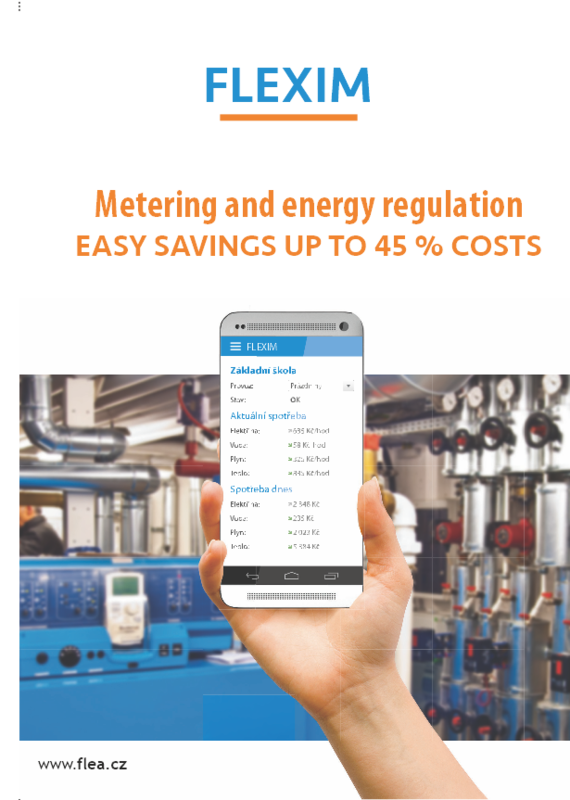 It monitors the entire heating system and enables customers to manage the system remotely via web interface using a PC or a mobile phone. Transparent data history – you can check how individual rooms/zones were heated (per day or any other period of time). Flexim installation will lead to substantial savings on heating in the building. In comparison with thermal insulation with plastic windows and Styrofoam the investment in zone regulation returns much faster. Depending on to the current state of the heating system the zone regulation can save 15 to 40 percent of heating costs. Most often, savings of between 20 to 25% can be achieved. The saved money can be then used as investment in additional austerity measures. The FLEXIM system control unit is an industrial computer running a software application for managing, monitoring and adjustment of the heating system. The control unit is protected against power failures. If the object is equipped with a secure Internet connection, the application can be installed on a remote central server. PID control – can simply be described in the following way: the proportional component of the control loop reacts to a specific temperature difference, the integral component is calculated from the knowledge of the regulation process in the past while the derivative component is based upon a temperature prediction for the future. The PID control algorithm is currently the most advanced algorithm of automatic control ensuring optimum functionality of the control loop with the fastest start and run-down, yet with minimal overshoot. Reference radio thermometer – RF thermometer is placed in each controlled zone (room). The radio thermometer continuously monitors room temperatures and wirelessly sends temperature values to the control unit at 5 min intervals. The radio controller and control heads – There is a radio-controller installed in every room room/zone, which, based upon signals from the control unit, controls control heads mounted on radiator valves. Control heads are controlled with safe voltage of 12-24 V. One controller can be connected to up to 16 control heads. Radio data transmission – Data transmission between the control unit, thermometers and controllers is made wirelessly using the radio frequency of 868 MHz. PC = control unit communicates with the radio network via an Ethernet gateway (WACO Ethernet GateWay). The controller is equipped with the WACO radio modem while WACO radio thermometers are used for temperature meter reading. Each controller can also serve as a repeater for distant controllers and thermometers, ensuring seamless signal coverage even in large buildings. The output power of a radio module is about 7 mW, which is many times (about 1000 times) less than that of a mobile phone. This value lies well below all technical and health limits. The radio modules are thus harmless and do not burden the environment with electronic smog. The zone control system is a system functionally independent of the so-called equithermal regulation (heating water temperature control according to the outside temperature). If the object has the equithermal regulation system installed, the two systems are complementary. It is even desirable that the boiler is equipped with equithermal regulation. Equithermal radio control enables the zone control system to operate at its highest heating efficiency and together they create optimal heating control system. FLEXIM can also control the source of heat, which increases the efficiency of the overall solution. If the heating system is equipped with the WACOtherm circulator pump, RF zone control may switch it so that the pump is operating only when at least one heating channel is open (i.e.at least one zone is heated). Each radiator is equipped with radio-controlled electromechanical valve that allows individual radiators to be electronically opened and closed as needed. Mechanical operation of the valve is controlled directly by a cable from controller outputs. Reasonable cable molding is used for cable installation. The radio thermometer is placed in each room/zone. Constant temperature monitoring allows the system to control the temperature in each room individually and independently of other rooms (temperature sensing interval can be adjusted freely, but a 5 minute interval is recommended). Therefore, it is possible to heat to the desired temperature only the room that is being used. Heating in other rooms/zones will remain at a reduced level. The controller with wireless modules is positioned so as to optimize cable lengths to individual radiator heads. One controller can handle multiple zones. Because the controller is powered by 220V, it is advisable that it be installed at the optimal distance from the socket circuit. The control unit that controls the system and communicates with the server on which the system web application is installed will be placed in the building. System settings and monitoring are done via web interface. You can oversee your objects from any computer or mobile device connected to the Internet. For individual users of the premises individual user accounts can be created, through which they will log into the system. Each user will be given access rights for individual parts of the building. The building manager will be able to control the entire building. The entire zone regulation system is modular, which allows for system control extensions by additional modules in any other particular room/zone anytime. Installation of the FLEXIM zone heating control system can be carried out during normal building operation hours. Control over individual parts of the building can be established in stages. FLEXIM system software application is, from the user’s perspective, set simply as a classical thermostat. For each room you set the desired temperature to which the system itself controls the room then. Actual and desired temperatures are shown in the application and are accessible through a web interface. The desired temperature is set in the application by either increasing or decreasing Celsius degrees or by switching to a preset profile (holidays, summer, etc.). The switching to the desired temperature is performed automatically, so that users do not have to worry about forgetting anything. Time-schedules can be saved as “profiles”. These profiles can then be easily switched between. For example, a user can save a profile called “Summer” when heating is switched off, or “Holiday”, where temperatures in rooms are reduced, or “Normal Mode” and so forth. For each profile a representing color can be assigned. Profiles can scheduled using the calendar. If you know that on Tuesday night you are going on vacation and you wish to return on Friday afternoon, just remember to put these events down in the calendar and the system, during your absence, will heat the object only at the reduced level. And when you return you will be awaited by a pleasantly warm room again.